If you’re struggling with mounting credit card debt you are probably looking for a credit repair company to relieve you of that debt. 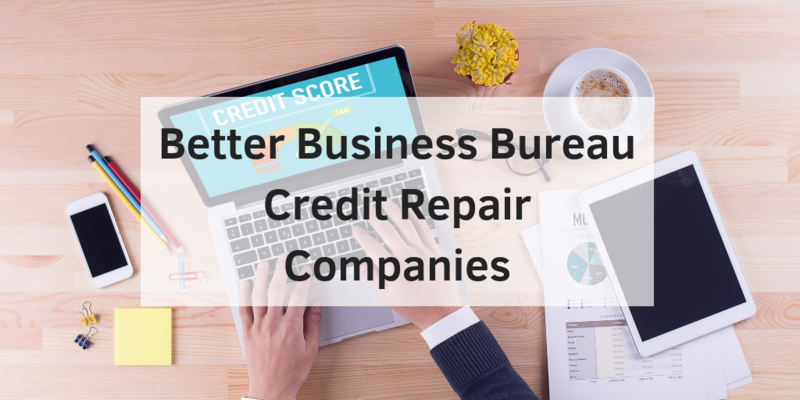 Finding the right credit repair company can be a daunting task, so we have compiled a list of Better Business Bureau (BBB) credit repair companies to help you make that decision easier. These credit repair companies have been given an A+ rating and they are in various different states. The BBB gives an A+ rating to companies who exhibit outstanding transparency and integrity to their customers. Go Clean Credit is one of the top credit repair companies in Yuma, offering personalized credit correction services since 2003. Because restoring your credit can be a daunting task, Go Clean Credit makes it a hands-on process specified for your needs. You may be dealing with mortgage correction, judgments, bankruptcies, student loans or identity theft. Go Clean Credit provides a trusted source for credit repair companies in Yuma. Their client-centered approach pairs credit restoration with credit education to keep you on the right track. They understand that good people can have bad credit and have helped thousands of people just like you. Most importantly they are not a faceless company that will treat you like a “number”. For 10+ years, Accelerated Credit Solutions has fixed issues on your credit report because they know what works and what doesn’t. They never use stall tactics to try to prolong the process because they do not charge monthly fees. They will never bill you until a successful service round is complete so you know exactly what you are paying for. Their services are not only cost-effective, but they are also low maintenance. All you have to do is keep up access to your credit monitoring, and they’ll do the rest. Once they remove negative items on your report, they will send you a detailed analysis, wait for you to check your new report and confirm the results. They will then educate you on how you can avoid these missteps in your future. When you are interested in using Fortress Credit Professionals for your credit repair needs they’ll conduct a free credit consultation and provide an estimate over the phone. If you don’t have a recent three bureau credit report they can order one for you. They will dispute all of your negative items on your report at once and only charge you for what they were able to remove. You will not pay a monthly fee because they believe that money can be used for more important things. Most of their clients finish within 90 to 180 days and can see improvements throughout the engagement. Is your credit score preventing you from being approved for a loan or your next big purchase? Accius Credit Repair can help repair your past and prepare you for a much better financial future. Accius offers a free initial consultation before they offer to help. They want to fully understand your situation so they can piece together a knowledgable action plan for you to succeed. After their evaluation, they will work closely with you to devise a personalized strategy and dispute inaccuracies with all three credit bureaus. Guardian Credit Repair is a national credit repair and restoration company working with clients and creditors to improve credit profiles. Their credit experts communicate with credit bureaus by challenging questionable, inaccurate, outdated, misleading, or unverifiable data on consumer credit reports. They investigate any mistakes which may be lurking in your credit report to have them resolved and repaired, allowing you the financial freedom and advantages a good credit score provides you. In order for you to feel like you learned something while working with their consultants, they will educate you every step of the way. For more information on the best Better Business Bureau Credit Repair Companies, contact Go Clean Credit to get back on the right track. We have many credit repair programs that are available to help you overcome your credit situation and place you back on the path to financial success. Real credit restoration is not a one size fits all model and we tailor your needs to the right program, but most people can start for just $99 per month. ← Does a Government Shutdown Affect Your Credit Score? Interested in Repairing your Credit? "I wanted to let you know your service was quite helpful to me. I was able to do a refinance on my mortgage a few months ago with very good terms. My score has gone from 687 to 743. Thanks for your help!